A 5km tunnel from Loch Benevean feeds Fasnakyle power station – the largest on this scheme. The turbines discharge into the River Affric. The Duke of Edinburgh opened the station in 1952. As early as 1918, people saw this area as one of the nine great sources of water power running to waste in the Highlands. However, it would be 30 years before a plan to harness this energy won approval. After two previous attempts failed, the southern section of the scheme in Glen Affric was finally approved in 1941. This project had the added benefit of reducing the severe flooding that often threatened this area. Ten years later, workers went on to build the scheme’s northern section in Glen Strathfarrar. Planners chose underground stations for the scheme to protect the area’s scenic beauty. They also thought of the salmon. Compensation water is released below the dams and several dams contain Borland fish lifts. Fully operating by 1963, the entire scheme today contains six dams and power stations. 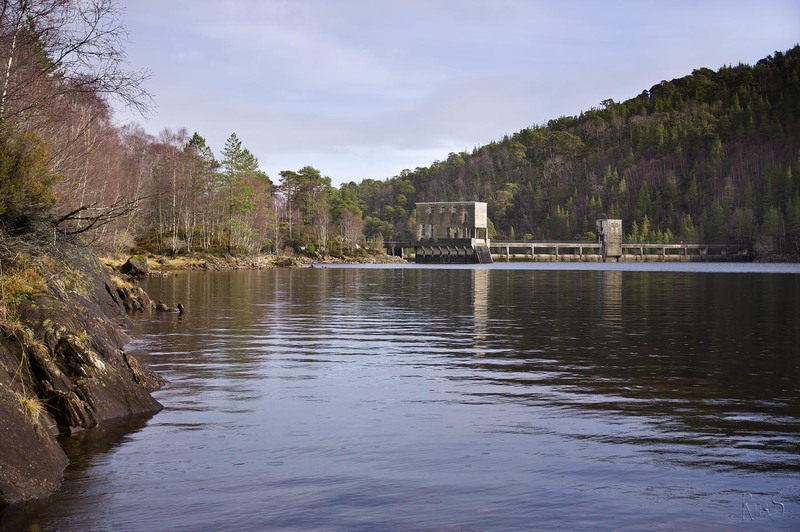 Completed in 1951, Benevean dam measures 177m long and 37m high. This gravity dam relies on its mass for stability rather than supporting buttresses. Loch Benevean stores water from Loch Affric and nearby hills. It also receives the discharge from Mullardoch power station.